For an explanation of effective size (Ne), please see Andrew’s Crowdsourcing ConGen post. Fisheries managers have become more interested in measuring Ne because of a growing concern that fishing is altering the genetic diversity of certain stocks. Census size (Nc) is a much simpler concept- it is simply the number of individuals in a population. A subset of this is the number of effective breeders. Note that this is smaller than the total population, since not every individual in the population is of breeding age. However, from a genetics standpoint, individuals that aren’t currently breeding don’t matter much since they aren’t passing their genes on to the next generation. The ratio of Ne/Nc has been used as a metric in the past for many species. Most commercially important marine organisms (i.e. oysters and cod) have an extremely low Ne/Nc ratio (10 ^-2 or 10^-4), while organisms such as marine mammals have Ne/Nc ratios much closer to 1. Prior to this study, the Ne/Nc ratio had never been calculated for a species of shark before. Sandbar sharks, a species near and dear to my heart because they are my study organism, are an economically important species in need of a better management plan. Though they were one of the first shark species in the U.S. to have a management plan at all (they’ve been managed since 1993), the current regulations are far from ideal. 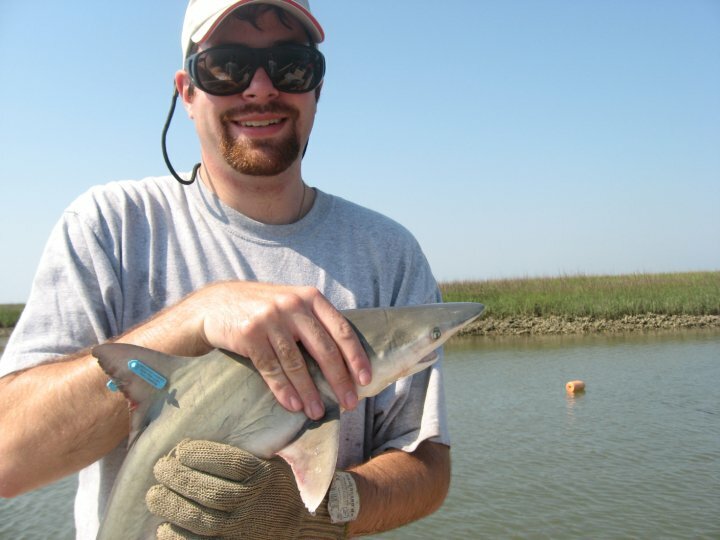 The 2006 National Marine Fisheries Service SEDAR for large coastal sharks, blacktips, and sandbars (available here) shows that the current management plan is lacking some important data, and next month there’s a NMFS meeting right here in Charleston to address some of these issues. These sharks are listed by the IUCN as “near threatened” in much of their range (which is worldwide). They are targeted for two reasons. Primarily, their relatively large dorsal fins are valuable for shark fin soup. 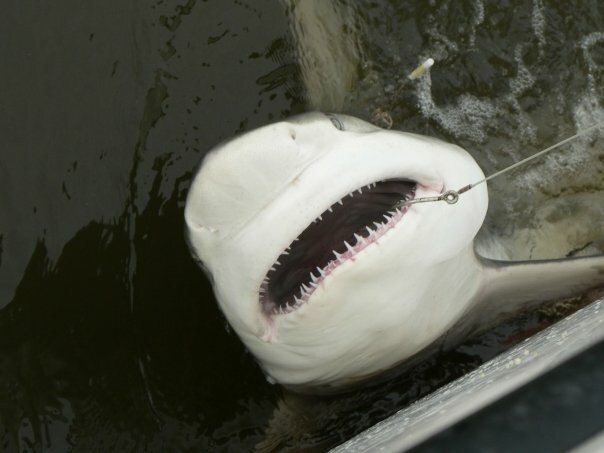 Secondly, they are one of the few shark species with palatable flesh. 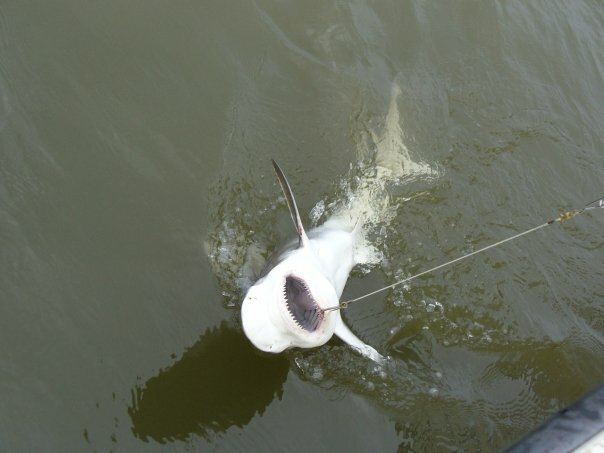 Some studies show that they make up approximately 2/3 of the United States commercial shark catch. Some population surveys show a greater than 80% population decline in the last few decades. They were one of the species that failed to get CITES protection at the last meeting. In addition to their importance from an economics and conservation perspective, sandbar sharks are also relatively easy to study on the population level. Their use of nursery grounds makes it conceivably possible to catch every newborn sandbar shark in the Northwest Atlantic (something which I help with here in South Carolina estuaries). It’s essentially impossible to get an accurate population count for shark species whose distributions are spread throughout the open ocean, but the neonates of nursery-utilizing species are all in a relatively small (and accessible) place. In this study, the number of newborns varied between 4,474 and 6,006 over three years. Once every newborn sandbar shark in the Northwest Atlantic’s main nursery grounds was captured, it is a relatively straightforward calculation to determine how many breeding females there are. Sandbar sharks are one of the best studied species of elasmobranchs, and scientists have known for decades how many offspring the average female has. This study calculated that there were between 533 and 715 breeding females in the Northwest Atlantic population, which is an Nc (including males) of between 1758 and 2289. Ne was calculated using two common methods – linkage disequilibrium and Jorde Ryman temporal. Values were similar between these methods and varied between 978 and 1266. The average Ne/Nc ratio was approximately 0.5, a value higher than for most commercially important fish and pretty similar to that of Bowhead whales and other marine mammals. What does this all mean? Well, animals with a low Ne/Nc ratio are better able to support fisheries. This isn’t the case with sandbar sharks, which have a very high Ne/Nc ratio. When you factor in all this information, you realize that sandbar sharks have a long generation time (approximately 20 years), low fecundity (on average less than ten offspring per year), and low population sizes (less than 1,000 breeding females in the Northwest Atlantic population). In other words, this is probably a species that we should not be fishing. I see two phenomena occurring here that affect Ne. On one hand, you have a recent bottleneck, recent enough that that the decline in Ne (calculated from genetic diversity) lags behind the decline in Nc. This results in a bias towards a larger Ne. The lower Nc will result in inbreeding depression, which will cause the Ne to drop and remain low for many generations, even if the Nc recovers. On the other hand, you have extremely comprehensive sampling. Theoretically, given an adequate number of markers, as the sampling approaches 100% of the Nc, effective size will approach census size, and the Ne/Nc ratio will approach 1. So what’s really going on is not that sandbar sharks share some life history traits with bowheads, but rather you’re in the middle of the a bottleneck event, where the genetics are a few generations behind the ecology. In other words, someone needs to be writing a grad school application to study ongoing bottleneck effects over the next 5 generations of sandbar sharks.